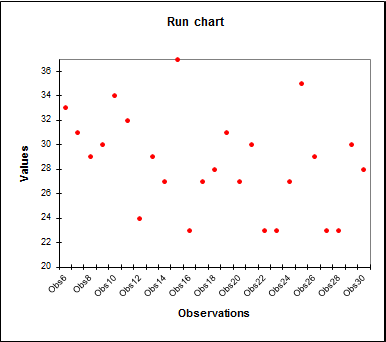 Attribute charts are used to investigate process quality based on qualitative measurements (one for each point in time). In Excel using the XLSTAT software. When to use an attribute control chart? Use this tool to supervise the production quality, in the case where you have a single measurement for each point in time. The measurements are based on attribute or attribute counts of the process. 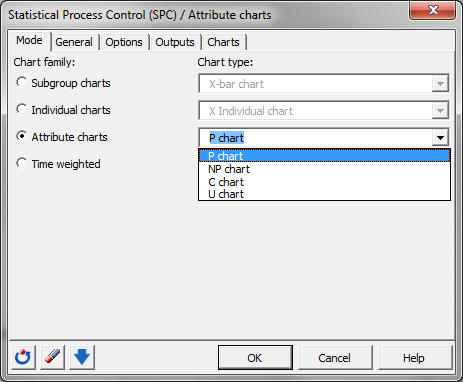 An attribute control chart is useful to recap the categorical variables of the measured production quality. Integrated in the attribute control chart tool, you will find Box-Cox transformations, calculation of process capability and the application of rules for special causes and Westgard rules (an alternative rule set to identify special causes) available to complete your analysis. P chart: A P chart is useful to follow the fraction of non conforming units of a production process. 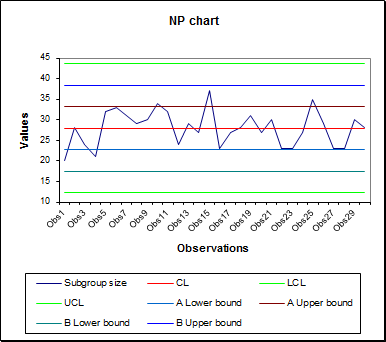 NP chart: An NP chart is useful to follow the absolute number of non conforming units of a production process. C chart: A C chart is useful to follow the number of non conforming units per inspection unit of a production process having a constant size of a inspection unit. U chart: A U chart is useful to follow the number of non conforming units per inspection unit of a production process having a non constant size of a inspection unit.